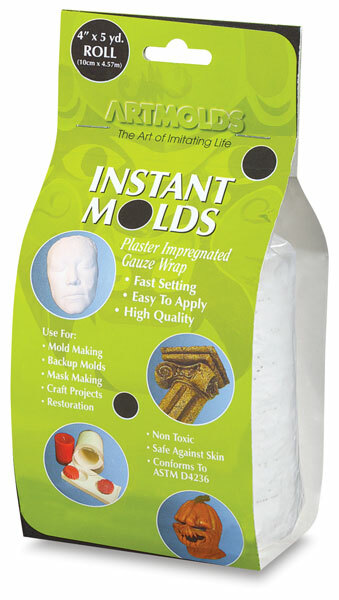 These quick-setting, high-quality gauze bandages saturated with gypsum and binder are suitable for making masks, shell molds, and life casts. Quick-covering and easy to use, simply cut bandages to length, dip in warm water, squeeze lightly, and apply. Due to the super saturation of gypsum and binder, this bandage provides a creamy, thick plaster consistency. Lap lines virtually disappear, making Instant Mold a great choice for both molding and casting. When applied by themselves on the skin, these bandages make a satisfactory mold, but lack the fine detail that alginate molds possess. Use them as a rigid jacket or "shell mold" over the rubbery alginate, as alginate will not maintain its shape when removed. Set time: 15 minutes. ® ArtMolds is a registered trademark.